Miss Mandy is liked by all. She’s polite to her mom when she’s on the phone, lends an ear when a friend is sad, and she knows how to clean up her mess when she’s finished playing. Miss Mandy has excellent manners, and that makes her a very popular girl. 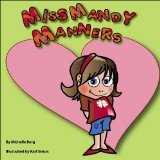 Miss Mandy Manners is told in rhyme with bright and cheerful illustrations.This very cute little girl shares her secrets of having good manners and behaving in a way that people will appreciate. Although the rhyme is a little forced at times, the message is a good one, and is told in a positive way that most kids won’t find preachy. If your little one is starting to learn her manners, she would do well to emulate Miss Mandy.